The keyboard is an important computer peripheral. Without it, you can’t play games, compose emails, edit documents, etc. Gaming on PC without a proper mechanical or wireless keyboard is nothing but a waste of time. If you’re a gamer who has connected a cheap keyboard to the computer, then you should upgrade your input hardware to one of the six devices we’ve covered in this article. The keyboards we’ve shared here have durable keys. They’re energy efficient and have a stunning design. X7C is one of the top-rated budget gaming keyboards on Amazon. It has an ergonomic design and backlit system that supports 7 different colors. X7C is durable and has a good polling rate of 1000 Hertz. It has an impressive keystroke lifespan of 10 million. X7C has six dedicated keys for launching multimedia applications and default Windows software. It has 19 anti-ghosting keys and requires 5.5 Volt power. X7C weights about 1100 grams. It has an intelligent independent lock. It’s priced around 2000 Rupees. Redgear Blaze 3 has floating keys and an aluminum frame. It supports 3 backlit color modes and has an option to lock the Windows key. According to Redgear, the keys of the Blaze 3 have a lifespan of 10 million. Blaze 3 has 19 anti-ghosting keys and 650 grams weight. It’s priced at INR 999. It is the only keyboard under 1000 Rs to feature a LED-backlit system. If you want to buy a DragonWar backlit keyboard, then GKM-001 is the best option for you. GKM-001 is a stylish keyboard. It offers a gold-plated USB connector and a mouse that supports 3200 DPI. GKM-001 ships with a gaming mouse that has six programmable keys. It provides a 1.8-metre fiber cable. It weighs 1120 grams and costs between 2000 to 2500 Rupees. GKM 001 costs Rs 2300. Priced below 5000 INR, the Prodigy keyboard from Logitech features Romer-G switches. Hence, it is one of the fastest mechanical keyboards in the markets. G213 supports RBG color customization with the Logitech gaming software. You can assign different functions to keys with this application. Logitech Prodigy provides 10+ function keys. It features a LED-backlit module that supports 16.0+ million color combinations. G213 is fitted with a 6 feet long cable. It weighs 1000 grams and has 452 mm width. The prodigy keyboard costs INR 3500. The Cynosa gaming keyboard is one of the best products from the computer hardware manufacturer Razer. It features a backlit system powered by green and black color emitting LED bulbs. It also provides several predefined gaming modes and has a spill-resistant design. This keyboard allows users to assign macro functions to the keys. Macros can significantly improve your performance in games that involve multiple key events. Razer Cynosa is priced at INR 4800. A good alternative to Adroit C7 is the Redragon Asura S101. 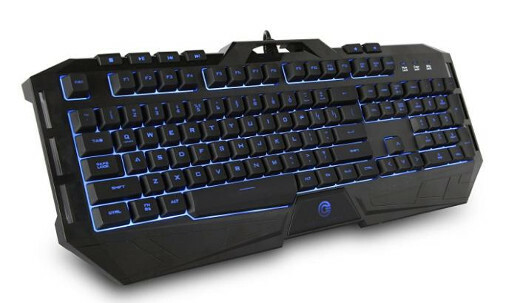 The keyboard costs below Rs 2000 and it is designed for PC gamers. It has a splash-proof design, 5 feet USB cable, gold-plated connector, etc. It ships with a mouse that supports 1000, 1600, 2000 DPI. Redragon S101 has 12 multimedia and 104 normal keys. It has red colored W, A, S, D buttons and 812 grams weight. Its price is 1999 INR. GK-001 is a stylish, durable and highly comfortable keyboard. It does not include a backlit system. It weighs around 470 grams and costs below 1000 Rs. The keyboard ships with a specially designed pad that will make your hands feel comfortable during long hours of the gaming session. It has a waterproof design and a USB port. The WASD keys on this device have been highlighted with blue color. Thus, you will be able to locate the keys quickly. This device is priced around 600 Rs. GKC 100 is a beautiful and feature-packed gaming keyboard under 1000 Rs. It has durable keys that last for up to 10 million strokes. GKC 100 has a spill-resistant design. It provides 4.5 feet cable and 10 multimedia keys. It weighs 690 grams. GKC 100 is priced at 900 Rs. Adroit is a top rated product on Amazon and one of the best budget gaming keyboards in India. C7 features 104 keys. It supports USB connectivity and has an excellent lifespan of 5 million keystrokes. It is priced between 2000 to 3500 INR. Adroit 7C flaunts control keys to control multimedia applications. It features a 1.2-meter cable. This device supports Windows Series operating systems. It includes three attractive lighting colors that can be swapped quickly. The keyboard has a stunning design and seven backlit modes. It costs 2100 Rs. BlackWidow is a mechanical keyboard that features backlit keys that have an impressive lifespan of 60000000 keystrokes. Blackwidow Ultimate supports USB connectivity. It ships with fiber cables, headphone and microphone port. BW provides a button that gives users quick access to in-game functions. It has a 1.5 Kg weight and 0.79 inches thickness. It supports Mac and Windows OS and costs below 10000 INR. The price of the Razer BlackWidow keyboard is Rupees 8999. Conclusion: DragonWar GK-001, GKM-001 Redgear Blaze 3, Circle Adroid X7C, C7, Logitech Prodigy, Razer BlackWidow Ultimate, Cynosa, and Gamdias GKC 100 are the best gaming keyboards in India.